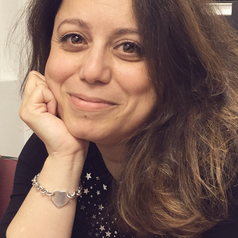 Nadia Naffi PhD is an Assistant Professor at Concordia University in the Educational Technology program, expert in disruptive pedagogy, and recipient of the Governor General Gold Medal – Person and Society – 2018. She was selected as a Concordia Public Scholar for 2017-2018 and was one of the winners of the SSHRC Storyteller national competition. Naffi delivered presentations and keynotes in national and international conferences on topics including: human performance technology, performance improvement, learning and development with disruptive technologies, teaching and learning with and through social media, online learning, online communities of practice, online problem-based learning, maker movement, cyberbullying, teaching about extremism, and online/social media propaganda. In her role of an assistant professor, she trains graduate students to become instructional designers, learning experience designers and performance consultants who design solutions for clients living in an AI era, and belonging to a wide variety of workplace contexts including schools, government, NGOs, and industries. Naffi's doctoral research addressed how hate, fear, and prejudice spread through social media. She identified a five-step model called “Get Ready to Act Against Social Media Propaganda”, which can be used in youth education to disrupt hate discourses. Her current research focuses on how to prepare the future workforce to thrive in an era of artificial intelligence (AI). With the rise of AI and of the digital world, workforces are evolving, jobs are changing and performing side by side and hand in hand with machines is becoming more and more expected. Getting ready for this new era is of utmost urgency. Naffi is affiliated with Milieux Institute for Arts, Culture, and Technology and the Centre for Immigration Policy Evaluation (CIPE) at Concordia University and the EILab at UOIT.